Man Ray–Human Equations showcases Man Ray’s depictions of complicated mathematical objects that he first encountered in the 1930’s. The models served as educational tools for mathematical students; however, Man Ray was interested in how they looked more than the specific mathematical equations they represented. Because the equations are fairly complicated and dense, The Phillips Collection incorporates a participatory experience, Formula Morph, into the exhibition to help visitors better understand the visual representation of the equations. Provided by the Museum of Mathematics in New York City, Formula Morph shows some of the same models and equations that are featured in the exhibition. 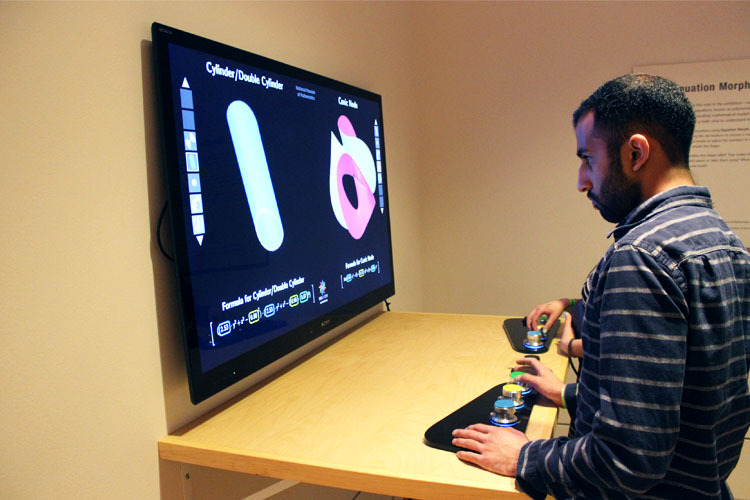 Users can select an equation, and adjust it using colored knobs that then alter the shape of the object on the screen. Formula Morph creates a visual connection between the objects Man Ray used with the complicated mathematical equations that they represent. 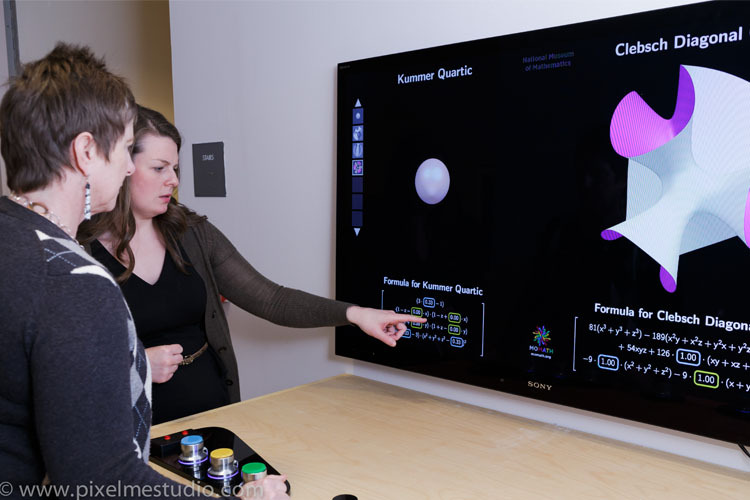 Visitors adjust colored knobs to alter the mathematical models on the screen. This entry was posted in Exhibitions and tagged art and mathematics, equations, manipulating formulas, math and art, mathematical models, mathematicians, MoMATH. Bookmark the permalink.